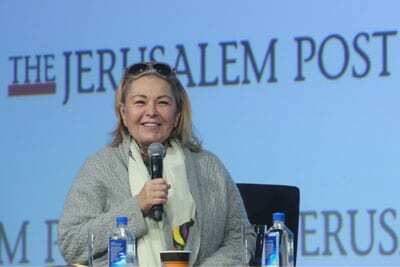 Roseanne Barr, the Jewish-American actress who made a name for herself in comedy and on television, talked about wanting to move to Israel and potentially running for office there while at the annual Jerusalem Post Conference on Sunday in New York…writes Shiryn Solny/JNS. American actress and sitcom star Roseanne Barr, who says she would like to make aliya to Israel one day. Credit: Jerusalem Post. During a discussion on stage, the “Roseanne” star said: “I want to move to Israel and run for prime minister. In 2012, I said I was gonna run for president of the United States and prime minister of Israel, a twofer. But I do have that fantasy, [and] if God calls me, I’ll go, of course. Barr also mentioned getting a phone call from U.S. President Donald Trump, who congratulated her on the successful reboot of her ABC sitcom, in which she plays the Trump-supporting matriarch of the Conner family. The show has been renewed for a second season. She then thanked the president for deciding to move the U.S. Embassy from Tel Aviv to Jerusalem. Barr was referring to the Boycott, Divestment and Sanctions movement that has proliferated on college campuses and elsewhere in the United States. Barr, who has been to Israel three times, additionally reflected on the recent controversy surrounding actress Natalie Portman’s decision not to attend the upcoming Genesis Prize awards ceremony in Jerusalem. She said she felt like Portman’s position, which seemed to be based on a reluctance to be present with Israeli Prime Minister Benjamin Netanyahu because she disagrees with his policies, “wasn’t the bravest way” to take a stance on something, and that it played into the hands of the BDS movement. In fact, she said, she “always” thinks about doing a cooking show—and who knows? It could very well be filmed in Israel.